You can work with it in many different ways and make the loveliest of cards for family and friends. 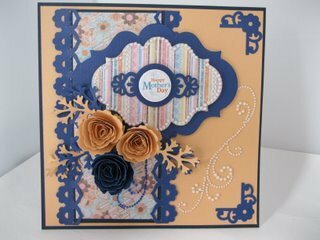 Do you admire the beautiful look that can be achieved with Spellbinders? The look that makes any card look so rich and elegant... and will give you that professional look each and every time. But maybe you don't have the dies themselves ... or the cost of them rules them out for you. Then this product could be your answer and it will bring that look more into your price range and there are lots of ways in which you can use it. It is a chipboard product that can help you get the look of Spellbinders even if you don't have the actual die sets. You can buy it in many of the shapes and sizes that the die sets come in and so it can be added to your cards in the same way. You can add paint to Nestaboard , sand it, stamp on it, emboss it with lovely patterns, use your Distress inks on them or colour them with Acrylic paint, water colors of marker pens. You could add some pretty paper to the shape and gently sand the edges to get a neat finish. And there are several sizes in each pack hence the name Nestaboard because they will all nest together. But here are some of the things I have done while playing around with this alternative Spellbinders product. On some of the videos that relate to Spellbinders you could substitute the die cut shape with a Nestaboard shape and still get the same result. So why not give Alternative Spellbinders a try and see if it fits the bill for the things that you want to do with your cardmaking.